In the one-shot The Thanos Imperative: Devastation #1, which spun off of the The Thanos Imperative mini series in which our universe is saved through the combined forces of many (but mainly Nova and Star-Lord), a team is brought together which would rival any Marvel team ever created. The heaviest hitters and biggest(in the words of Peter Quill, Star-Lord) "bad-asses" have been brought together to stop the threats to the galaxy that shear bravery cannot dispense. The team's name: the Annihilators. All five of them are down to battle, two of them use hammer-like weapons, one surfs, one accuses, one has a sweet mo-hawk and another has the prettiest bracelets in the universe. That's pretty much the team break-down. While I think the team is cool, I can see this book running into the Superman dilemma. The Superman dilemma, in this case, refers to the idea that when one (in this case one team) is at the top of the power scale, it becomes extremely difficult to find suitable villains or opposition to stand a chance in a fight or create a compelling story. In the case of Superman, writers have gone the magic, mind over might and "only weakness" (kryptonite) routes. Against this Marvel team I suspect the route may involve their compassion for life. The team and possible story paths have me interested to pick-up the Annihilators when it hits stands in a couple of months. I did say John Romita Jr... I have proven I'm a nerd once more. I totally dig your blog by the way. Its been a daily regular for me. Keep up the good work! 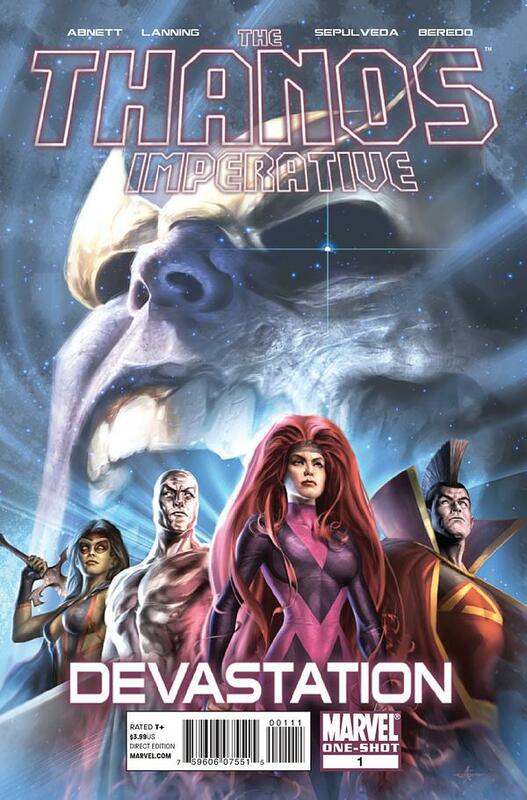 That comment was for the blog right above this one... but now that I have to comment on Thanos Imperative - I freaking loved it! Thanks Sollywoods! I'll try to pump out the posts a little more on time.